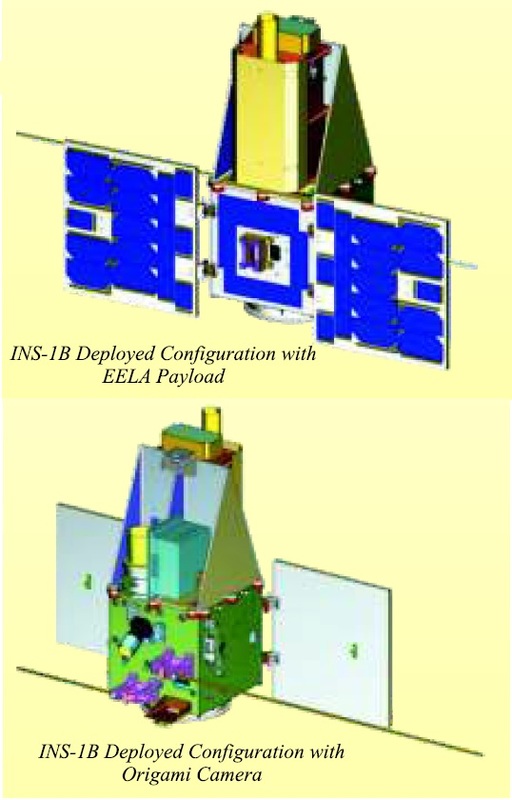 INS-1A and 1B are two Indian Nano Satellites based on a new, versatile satellite platform developed by the Indian Space Research Organization to host a variety of experimental payloads for short-duration demonstration missions. Employing a highly modular desgin, INS can be fitted with a variety of payloads for technical demonstrations and scientific missions. ISRO hopes INS will provide an opportunity for developing countries to put their payloads into orbit aboard the cost-effective satellite platform that can be launched relatively cheaply as a secondary payload on the PSLV rocket. INS has been designed with a platform mass of around 5 Kilograms, capable of facilitating payload of up to 5kg with standardized structural and electrical interfaces. Typical INS mission durations are six months to a year. 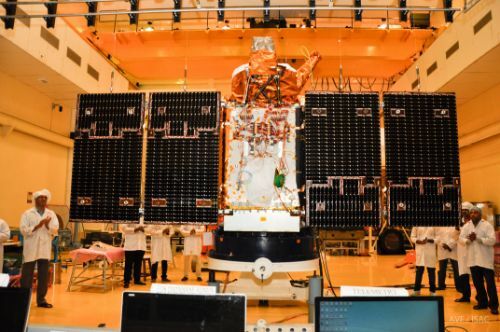 Two INS satellites are being launched on the PSLV C37 mission with the major objective of demonstrating the INS satellite platform in an operational environment to make the bus available for future flight opportunities. 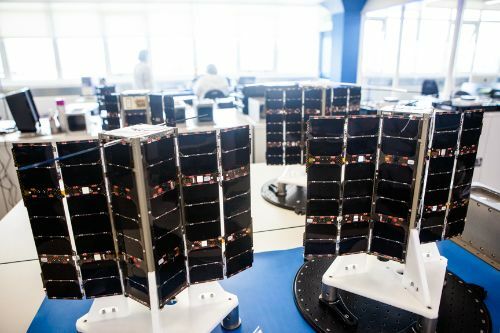 Both satellites use the same box-shaped bus module that provides the satellite’s core functions such as power generation, attitude control, and data handling. On the top side of the platform structure sits the payload module that facilitates the experimental senors and their electrical support systems. 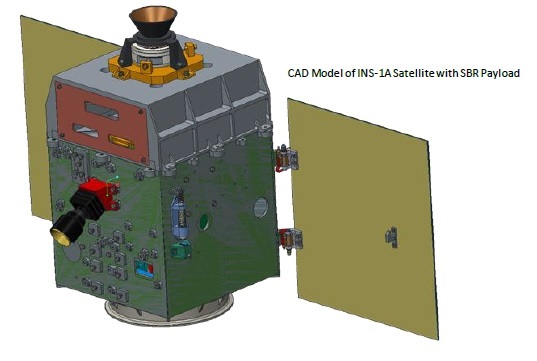 The INS-1A satellite weighs in at 8.4 Kilograms and hosts a pair of compact payloads, a Surface Bidirectional Reflectance Distribution Function Radiometer (SBR) and a Single Event Upset Monitor (SEUM). In its stowed configuration, the satellite measures 30.4 x 24.6 x 36.4 centimeters in size with an Earth-facing deck on the zenith panel of the spacecraft and a cylindrical payload adapter on the aft panel. Two rigid solar panels deploy once the satellite arrives in orbit, measuring 67 centimeters from tip to tip. 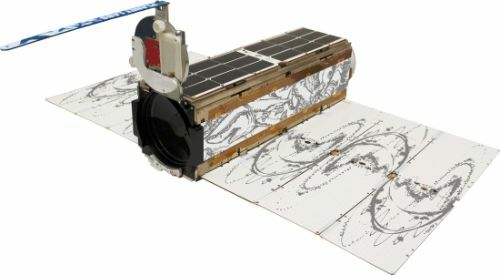 The SBR payload was developed at the Space Applications Center (SAC) and measures the Bidirectional Reflectance Distribution Function (BRDF) of targets on Earth’s surface – a fundamental radiometric parameter that is dependent on the vectors of solar incidence, outgoing reflection and surface normal as well as the properties of the surface itself. This measurement is of relevance for the correction of in-situ or satellite measurements of Earth’s surface and needs to be taken into account in order to standardize collected data from different sensors to make them comparable with each other. 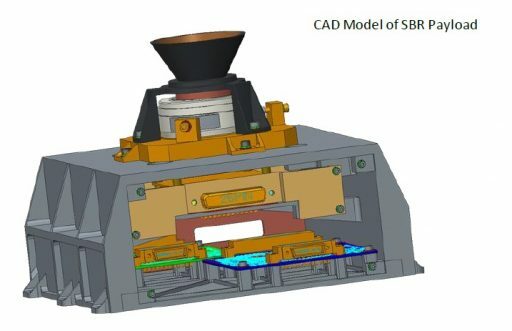 BRDF correction is typically completed using algorithms that are based on measurements conducted on different surfaces and SBR is expected to add spaceborne data for the refinement of correction models. Reflectance readings are acquired by a camera head and processed in a dedicated electronics assembly based on an Alcatel CPU. 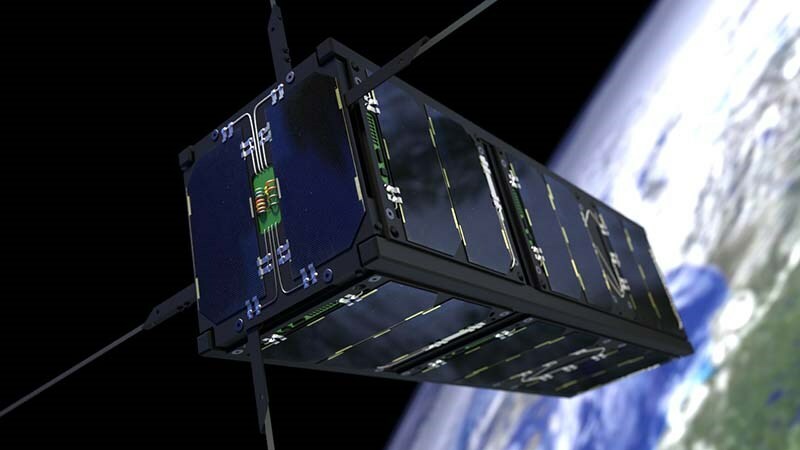 The SEUM payload was also developed by SAC and is designed to subject a number of Commercial Off The Shelf electronics to the space environment and monitor their Single-Event Upset rate in the challenging radiation environment of Low Earth Orbit. This provides valuable information on what components are suitable for use in operational space missions instead of more expensive radiation hardened systems. The INS-1B satellite has a liftoff mass of 9.7 Kilograms and hosts an Earth Exosphere Lyman-Alpha Analyzer (EELA) and Origami Camera. It measures 30.4 by 24.6 by 51.0 centimeters in size when in its stowed configuration, standing 15 centimeters taller than the INS-1A satellite due to the different payload module configuration. EELA was developed at the Laboratory for Electro-Optics Systems to measure the spectral signature of atomic hydrogen in near-Earth space, in particular Earth’s exosphere that has a defined upper boundary at half the distance to the Moon at which point atomic hydrogen can no longer be held by Earth’s gravitational pull. The Ly-α line is a very prominent spectral feature of hydrogen located in the UV wavelength range at 121.567 nanometers and very frequently used in astronomy to measure the abundance of hydrogen in various sources. The measurement of atomic hydrogen in the exosphere is of interest in several areas including the study of atmospheric escape mechanisms at Earth which is also applicable for other bodies in the solar system including Mars. Additionally, the ratio of the amount of hydrogen at the 100-110-Kilometer range to the amount of Hydrogen at 200/300 Kilometers is a very sensitive tracer of exospheric temperature. EELA attempts a quantitative measurement of the Lyman-Alpha flux in the terrestrial exosphere over the critical altitude range for temperature measurements as well as the interplanetary background flux that will be obtained through deep space observations. 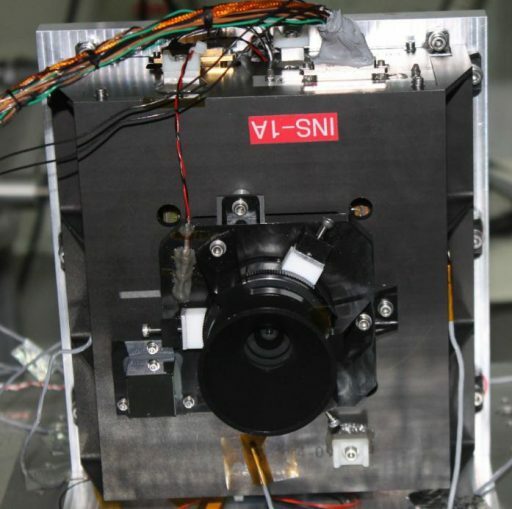 The Origami Camera, developed by SAC, is the result of two years of work and the first test of an Origami Lens on an Indian spacecraft. Origami lenses have been around for about a decade and, in essence, represent folded telephoto lenses – allowing telephoto optics to be slimmed down significantly while retaining their optical properties. Origami lenses use conventional astronomical telescopes as a basis, though at a much smaller scale – reflecting light within a concentric optical system to create the necessary focal length. The INS-1B Origami Camera aims to demonstrate the performance of the optical system in the space environment, also assessing future application of origami lenses in operational satellites.